100% METAL SHOWER HEAD HOLDER FOR HAND HELDS ~ Are you tired of those cheap plastic shower head holders that constantly break? Designed and tested in our facility in San Diego, California, this shower head holder by HammerHead Showers is built from the highest quality brass, making this the last one that you'll every need!. UNIVERSAL SHOWER HEAD HOLDER FITS MOST HAND HELD SHOWER HEADS ~ Uniquely designed to fit a wide range of hand held shower heads, whether it's Delta, Waterpik, Kohler or Moen. 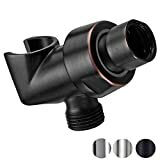 And with its universal shower arm mount connector, you'll be able to replace your old shower head holder in no time!. ADJUSTABLE SHOWER ARM MOUNT WITH BRASS PIVOTING BALL ~ The shower arm mount's brass pivoting ball has 360 degrees of rotation, so you can perfectly adjust the angle of your handshower. Supporting a minimum of 13 pounds, you can confidently use your heaviest hand held shower heads without the shower head holder drooping..
90-DAY MONEY BACK GUARANTEE & HAMMERHEAD SHOWERS LIMITED LIFETIME WARRANTY ~ Buy with confidence knowing that you're covered by HammerHead Showers World-Class Customer Service. We pride ourselves on quality and we're here to support you in the case your shower head holder requires repairs or replacement parts.. Solid Metal Shower Head Holders by HammerHead Showers ~ 100% Built From Brass, 100% Built To Last! Are you fed up with all of the cheap plastic shower head holders that constantly break? That's exactly why we started HammerHead Showers. With years of experience in the plumbing industry, we have used our installation and design expertise to manufacture the world's highest quality, solid metal shower heads and accessories. Each HammerHead Showers product is designed and tested in the USA, right here in San Diego, California. 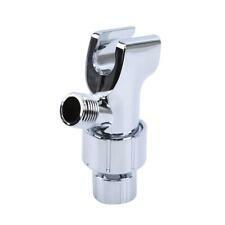 So buy with confidence knowing that you're getting a heavy duty, solid metal product that would make any plumber proud! 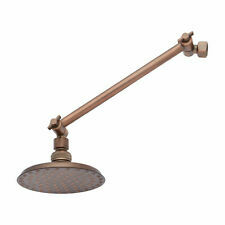 Key Features & Benefits: - Solid Metal Shower Head Holder ~ Made From Brass That Won't Break Or Leak. 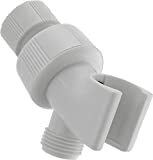 - Universal Shower Arm Mount Replacement Part ~ Fits Most Hand Held Shower Heads, So You Can Use Your Existing Shower Head With Hose . 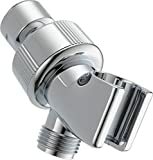 - Adjustable Pivoting Ball ~ Easily Rotate The Shower Holder 360 Degrees To Find Your Perfect Handheld Showerhead Angle. 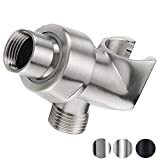 - Uses Standard ½" NPT Connector ~ When We Say Standard, It's About As Standard As It Gets. 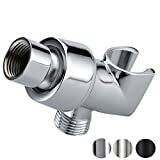 The ½" NPT Water Pipe Connection Is Used On All Wall Mounted Shower Arm Pipes In The USA, So You Can Easily Unscrew Your Old Detachable Shower head Holder And Screw On This Solid Metal One In No Time. - Includes Everything You Need For Installation: (1x) Handshower Holder Bracket, (1x) Rubber Shower Washer, (1x) Roll of Teflon Tape and Instructions. - Even a beginner DIYer can install this in minutes! Backed by HammerHead Showers 90-Day Money Back Guarantee & Limited Lifetime Warranty! Buy with confidence knowing that you're covered by our World-Class Customer Service. Don't settle for a cheap plastic shower head holder that will break, leak or crack. Upgrade to an All Metal Shower Head Holder by HammerHead Showers, and make this the last one that you'll ever need! INCLUDES EVERYTHING YOU NEED, INSTALLS IN MINUTES! ~ At HammerHead Showers, we're not just making solid metal shower products, we're making them easy to install. In each box, you'll receive (1x) shower head holder, (1x) preinstalled rubber washer, (1x) roll of Teflon tape and easy-to-read installation instructions. 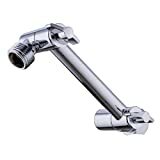 With an adjustable wrench and some elbow grease, you'll have your all metal shower head holder installed in minutes!. 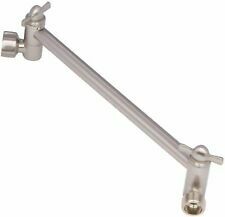 4-inch Adjustable Height Arm Mount for Shower head Combo,Sturdy Solid Brass Construction. Special Structure for Heavy Weight Support, Chrome Finished. 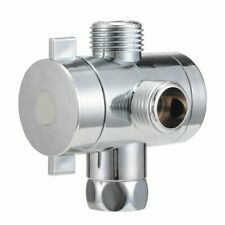 1/2"IPS Female Thread Connects to Shower Arm,1/2" IPS Male Thread Connector to Showerhead. 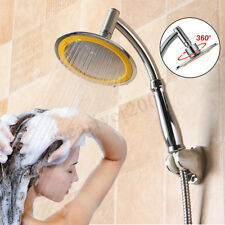 Adjustable Height Shower Head Arm Easy for Any Shower Angles. Note:The product does not come with a hose, it is just the mount for the handshower.